I can tell you for a fact that the referral fees for sending a borrower from a hard money broker to subprime have dwindled to nothing. Oh their has to be tons of laid of liar loan officers all over Sacramento. I bet these guys have all sorts of crooked stories to tell about their former employers. Look at the guys who got shxx canned from Coastal Pacific Mortgage. You guys are probably a little disgruntled, tell us some good stuff. Look they canned you and told you to leave, you owe them nothing, but the same misery they bestowed upon you. I was listening to a local investment talk show yesterday on KFBK and some caller with a rental house asked about selling his rental in this market. It seems he HELOC'd $60,000 to go buy his new house and now the rental was about $900/month negative. The advisor told him he could sell it now, or plan on hanging on to it for 10 more years, because prices were probably going to drop another 10-20% before they hit bottom. 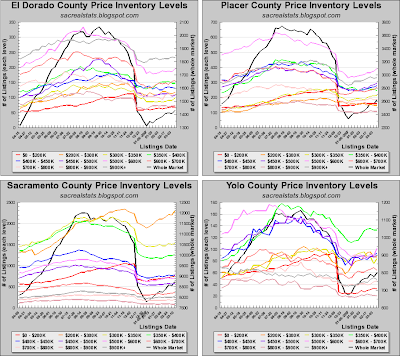 Then the advisor said the Sacramento area would take about 10 years to recover to today's prices. It was nice to see some straight talk from people in a position to make a qualified assessment. You do not hear that very often. It looks like a bounce may have happened in Novemeber/December and then a steady decline. However, housing tracker seems to remain constant with the median price. However, housing tracker seems to remain constant with the median price. 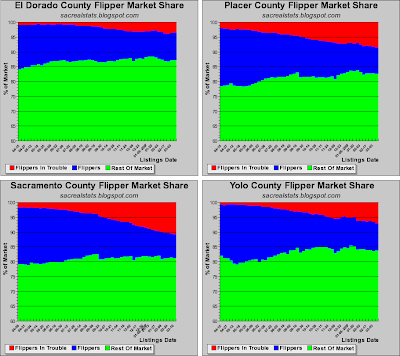 Housing Tracker goes by neighborhood, while my data is county-wide. They also lump different counties together. Not that they're data isn't accurate; just that we're measuring different things. Keep in mind Housing Tracker lists only the asking prices. As the Realtors say "That's the most they will take!" Asking price, I see, should have know. Anony - if you are talking about the investment talk show "H&M" remember they don't know much about real estate except their business completes with real estate investment - nice netral advice! The weeks ago, the real estate talk show on KFBK had a special on short sales and sub prime borrowers who were stuck. Even the host said real estate had gone down 10% last year and the forecast was another 10% drop in the coming year. 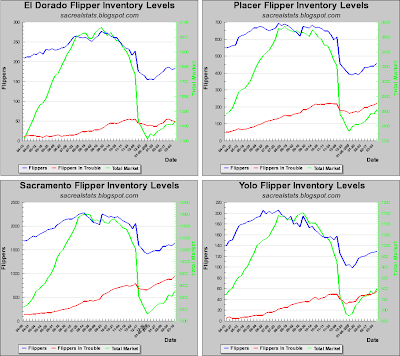 I believe it is pretty common knowledge today that the Sacramento real estate market is in for a very rough ride in the next 5 years. In fact, a knowledgable source recently mentioned the elevator may not get back to the top floor any time soon! That I did. 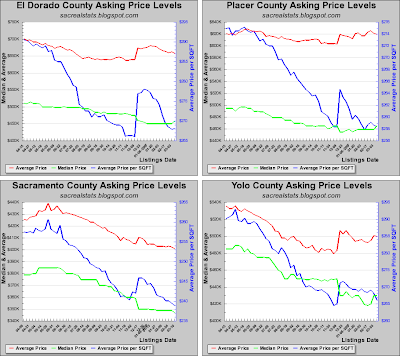 Agree that both percentages will someday reflect in the median price in Sac area; however, some places more, some less, some sooner than later. The builders already took care of that 20% and are having success. Area from east sac out to Fair Oaks and Folsom has already been there and bouncing back. The higher end is moving on without asking the rest of us. Looks to me like the commodity priced housing, vast areas of production homes with more on the way are still "adjusting". But the next opportunity ot throw someone elses money into a home and flipping it in 3 months without ever moving in, will likely not happen again here.